Newcomer Family Obituaries - Gordon R. Murray 1951 - 2019 - Newcomer Cremations, Funerals & Receptions. Gordon R. Murray, 67, of Tallmadge, passed away on April 11, 2019. Gordon was born in Akron on October 7, 1951 to the late Isom and Dolores Murray. Gordon was a longtime licensed beautician and also worked as a nanny and personal assistant. In his free time, he enjoyed working in the yard and relaxing by the pool. His favorite places to visit were Arizona, Florida, and California. Gordon will be dearly missed by his siblings, Audra Lewis, Kim Randolph, and Dave Murray; nephew, Jason Lewis; good friends, Karen and Bill LeMon and Cheryl and Dave Gambel; and his beloved Yorkies, Malynn and Wags. Visitation will be held on Saturday, April 20, 2019 from 1-3 followed by a 3 p.m. memorial service at NEWCOMER FUNERAL HOME, 131 N. Canton Rd., Akron. Add your memories to the guest book of Gordon Murray. Gordon, your friendship meant so much to my mom, Lois Ignizio. You could often be found "hanging out" in her kitchen after doing her hair. We shared laughs, memories of Brookdale Lane "olden days," and many recipes. You loved her lasagna and learned to make it just like she did. I know i never said i love you enough and now i wish i could say it one more time. If there was a manual to read on how to bring you back i would read it cover to cover and then read it again. It's going to be hard not having you around, you are in my heart brother. Now that you are in heaven and in god's great hands your heart will be healed and your health will be forever lasting. Please tell mom and dad when you see them i love them as well. One day we will all be together again. I know you were afraid brother but now you no longer have to be afraid, god has you in his care. Once again brother i love you and miss you. Gordon was one of the nicest people I've known. He was our neighbor for 50 years. I'm sure going to miss him. 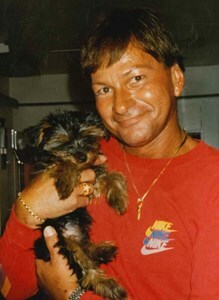 I actually came across a picture of his Afghan dog he had years ago. He always was so welcoming of everyone. Always had such a nice smile. He is going to be greatly missed. I jamie have known gordon and his family for many years. He took care of my boys for several years while my wife and i was working. I have alot of good memories with him. You will be missed gordon you and your family have always made me feel like a part of the family. Love you and the family.